When it comes to time management with your direct sales business, keeping an effective “to do list” is critical to your success. Nothing is as satisfying as putting a line through something you needed to accomplish. However, an effective “to-do” list is more than just a bunch of unrelated tasks thrown down willy-nilly on a piece of paper. If you’re wondering why your list is always growing, but nothing ever seems to get done — take notes, this information is for you! First things first, find what system works for you. 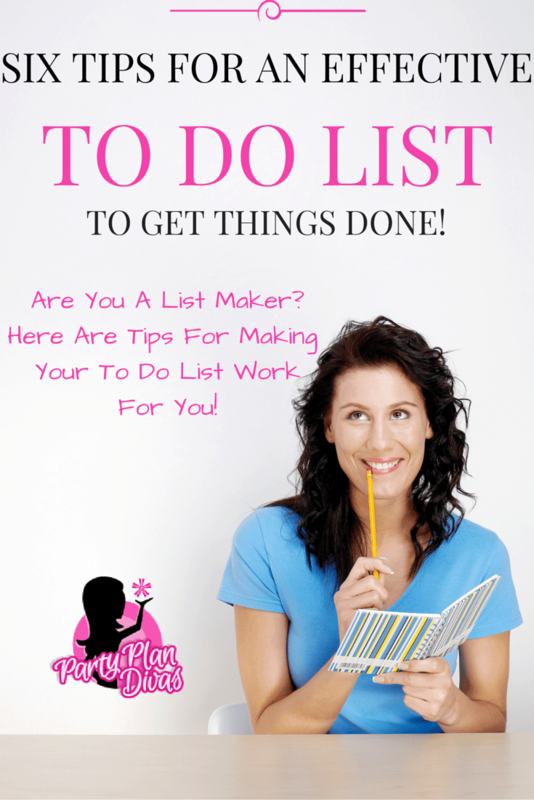 Do you function better with a daily list or one that is kept running over time? Do you prefer something separate in a notebook, or integrated right into your calendar? What about an electronic list like Trello? Your system doesn’t have to make sense to anyone else, just you, but make sure you actually have one. Visualize your end goal, and break it down into more manageable chunks. If you know you have a project that needs to be done at the end of the month, break down the steps week by week, and then day by day. You’ll know that by accomplishing one small task each day, that you’ll be right on track to having the entire thing done right on time. You can use numbers, letters, or even colors, but sort your tasks into priority order. Generally, 3 categories (high, medium, low) will suffice. Schedule your high priority items for times when you know you’ll be focused and ready to accomplish them. Save lower priority items for the end of the day when you might be losing steam. If you have a bunch of items to do that are similar, like phone calls, bunch them all together. It makes more sense to make five phone calls in a row than to constantly switch gears to do paperwork, answer emails, or run errands. Keep phone calls short and to the point, and if possible, let incoming calls go to voicemail if you are in the middle of something else. Take a hard look at your list, and cut out tasks that truly aren’t important. If you had a hard time prioritizing them (or wishing you had a category lower than “low”) maybe it’s time to just let them go. This is especially true if you feel like you’re constantly transferring them from yesterday’s list because they were left undone. Free yourself from the stress, and just get rid of them. No, it doesn’t have to be a new Benz, but figure in small rewards for completing your daily tasks. Made those five phone calls? Take a ten-minute break to get some fresh air and people watch. Finally finished that mind-numbing spreadsheet? Treat yourself to a favorite snack. Remember my mantra – activities that are rewarded are repeated – so reward yourself for every task completed! Before you know it, your new habit will be completing everything you start… how cool will THAT be? !